SeaCure Moving are New Jersey Interstate Movers that have successfully moved residents and businesses across the United States since 1981. At SeaCure Moving we take pride in providing our customers the most reliable and efficient interstate moves possible. With over 30 years of interstate moving experience we are capable of handling any challenge. Over the years we have developed a long record of quality service and customer satisfaction which is why we have become one of the most trusted and reliable New Jersey Interstate Movers. We offer a range of custom moving solutions that are designed to maximize the efficiency of the moving process while keeping your items safe and secure throughout the duration of the move. 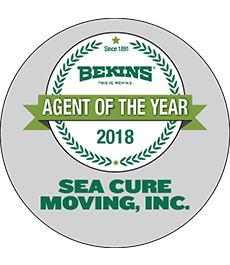 As an Agent of Bekins Van Lines we are able to take on any type of interstate move. All of our interstate moving agents have access to advanced technology that will ensure the success of any interstate move. As Full-Service New Jersey Interstate Movers our success is determined by how seamless of a transition we made for our customers. As New Jersey Interstate Movers we take the necessary steps to provide effective and reliable moves for both residents and businesses. If you’re looking for New Jersey Interstate Movers that are reliable and affordable then contact SeaCure Moving or fill out our quote form for a free moving quote today!